Please enjoy this talk by Dr Stephanie Dowrick , addressing the need and desire that so many of us have to create greater or more sustained peace in our hearts. Peace cannot stop in our hearts, of course. 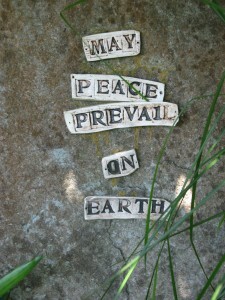 But if there is no peace in our hearts, our efforts to live in greater harmony with others will be severely limited. Peace in our hearts is a prelude to our happiness, a cause of happiness, a cause of inner confidence and strength. 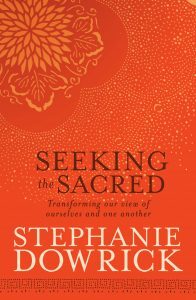 As Stephanie makes clear, it takes will, insight, determination to cultivate or even understand the desire for peace. And to know that peace is an active state of mind: alive, alert, receptive. This talk was recorded at the August 2012 spiritually inclusive service that Stephanie leads, one of monthly services that she offers at Pitt Street (264) Uniting Church, Sydney. (3rd Sunday of each month, 3pm). You are most welcome to attend these services. And if you are far from Sydney, please feel part of this welcoming, inclusive community by listening to this and Stephanie’s other talks, by joining her on Facebook, and particularly by using the buttons below and sharing with others whatever links or books you have found inspiring. Previous Previous post: Visit and enjoy the Universal Heart Book Club!